The function of the fission yeast cullins Pcu1p and Pcu4p requires modification by the ubiquitin-related peptide Ned8p. A recent report by Lyapina et al. shows that the COP9/signalosome (CSN), a multifunctional eight subunit complex, regulates Ned8p modification of Pcu1p. Disruption of caa1/csn1, which encodes subunit 1 of the putative S. pombe CSN, results in accumulation of Pcu1p exclusively in the modified form. However, it remained unclear whether this reflects global control of all cullins by the entire CSN complex. We demonstrate that multiple CSN subunits control Ned8p modification of Pcu3p, another fission yeast cullin, which, in complex with the RING domain protein Pip1p, forms a ubiquitin ligase that functions in cellular stress response. Pcu3p is modified by Ned8p on Lys 729 and accumulates exclusively in the neddylated form in cells lacking the CSN subunits 1, 3, 4, and 5. These CSN subunits co-elute with Pcu3p in gel filtration fractions corresponding to ∼ 550 kDa and specifically bind both native and Ned8p-modified Pcu3p in vivo. While CSN does not influence the subcellular localization of Pcu3p, Pcu3p-associated in vitro ubiquitin ligase activity is stimulated in the absence of CSN. Taken together, our data suggest that CSN is a global regulator of Ned8p modification of multiple cullins and potentially other proteins involved in cellular regulation. The cullin/RING family of ubiquitin ligases comprises a multifunctional set of enzymes controlling the stability and activity of cell cycle regulators, transcription factors, and signaling proteins (reviewed in ref. ). Among the best studied examples of cullin/RING enzymes are the so-called SCF complexes. SCF complexes share homologues of the core components cullin 1 (CUL1), SKP1, and the RING domain protein HRT1/RBX1/ROC1, which associate with different F-box proteins and ubiquitin-conjugating enzymes . F-box proteins specifically bind substrates, following their phosphorylation in response to activation of various signaling pathways. Although substrate phosphorylation is one major determinant of SCF-mediated ubiquitylation , covalent modification of the CUL1 subunit through attachment of the ubiquitin-related peptide NEDD8 also regulates SCF activity. NEDD8 modification stimulates SCF-dependent substrate ubiquitylation in vitro [2,3,4], and mutant CUL1 resistant to NEDD8 modification is defective in vivo . In addition, fission yeast mutants deficient in the enzymes that attach Ned8p, or in the ned8 gene itself, are inviable . In addition to CUL1, the human genome contains at least five other cullins, CUL 2, 3, 4A, 4B, and 5. This diversity is partially recapitulated in S. pombe, which encodes pcu3 and pcu4, homologues of human CUL3 and CUL4, for which there are no direct correlates in budding yeast . All human cullins interact with HRT1/RBX1/ROC1 , are modified by NEDD8 , and have ubiquitin ligase activity in vitro . Similarly, the fission yeast cullins Pcu1p and Pcu4p are neddylated, and neddylation is critical for their function in vivo. . While it is clear that neddylation affects the activity of cullin/RING complexes, mechanisms controlling this modification are just emerging. A recent study by Lyapina et al. uncovered a novel connection between the COP9/signalosome (CSN) and cullin neddylation . CSN is a highly conserved multiprotein complex consisting of eight subunits, which have been implicated in a wide variety of regulatory processes, including, cell cycle control [11, 12], signal transduction , transcriptional activation , and plant photomorphogenesis [15, 16]. To date, no distinct biochemical activity has been identified that can reconcile this diversity in CSN functions. The eight CSN subunits show a one-to-one relationship to components of the 19S proteasome lid complex [17,18,19] and, like pcu3 and pcu4, at least seven of the eight human subunits are conserved in fission yeast, but not in budding yeast. [16, 20]. Lyapina et al. recently showed that disruption of S. pombe CSN subunit 1 (caa1/csn1) results in accumulation of Pcu1p in the neddylated state . However, it remained unclear whether this reflects global control of multiple cullins by Csn1p as part of the entire CSN complex. We have examined this question by determining the effect of disruption of several CSN subunits on Pcu3p neddylation, localization, and ubiquitin ligase activity. Our results indicate that the entire CSN complex is required for proper control of the neddylation state of multiple cullins. Immunoblotting of protein lysates prepared from S. pombe cells, whose pcu3 chromosomal locus was modified to encode Pcu3p with thirteen copies of the Myc epitope attached to its C-terminus, revealed two distinct species of Pcu3p, which migrated on SDS gels as two closely spaced species of roughly equal abundance (Fig. 1A). Several findings indicate that the slower migrating form of Pcu3p arose from covalent modification with the ubiquitin-related protein Ned8p: First, overexpression of a fusion protein of Ned8p and glutathione transferase (GST-Ned8p) converted the faster, unmodified form of Pcu3p into a high molecular weight species that reacted with antibodies to GST (Fig. 1A). Second, replacing lysine 729, which is homologous to the conserved neddylation sites in other cullins, with arginine, completely abolished the slower migrating, modified form of Pcu3p (Fig. 1B). In contrast, mutation of a neighboring conserved lysine (residue 760) did not alter the mobility of Pcu3p. Thus, as with other S. pombe cullins , Pcu3p undergoes covalent modification by ubiquitin-like Ned8p at lysine 729. Pcu3p is modified by Ned8p on lysine 729. (a) Cells containing Pcu3p tagged with 13 Myc epitope tags at the C-terminus (pcu3-13myc cells) were transformed with a pRep3-based plasmid driving the overexpression of a fusion of GST with S. pombe Ned8p. Pcu3p-13Myc was immunoprecipitated and precipitates were analyzed for the presence of Pcu3p and GST-Ned8p with the antibodies indicated. The lower panel shows GST-Ned8p expression in the toal cell lysates. (b) N-terminally Myc epitope-tagged wild-type Pcu3p or point mutants where lysines 729 and 760 were replaced by arginine were expressed from pRep81. Cell lysates were blotted with Myc antibodies to reveal the neddylated and unmodified species of Pcu3p. The comparatively low level of Pcu3p neddylation in this experiment may be attributable to overexpression. Interestingly, fission yeast caa1/csn1 deletion mutants show a set of defects, which partially overlaps that found in pcu3 disruptants: slow growth, cell elongation, and sensitivity to UV-irradiation, but not hydroxyurea [6, 21]. With respect to the recent implication of CSN in cullin regulation , we considered the possibility that the overlapping phenotypes of csn1 and pcu3 mutants could arise from interference with Pcu3p function. Initial support for this hypothesis was provided by the observation that disruption of csn1 led to accumulation of Pcu3p in the slower migrating form (Fig. 2A). This shift in migration is due to Pcu3p neddylation as shown by overexpression of GST-Ned8p in csn1 mutants. This caused an additional supershift, converting a substantial portion of the slower migrating form into a GST-Ned8p modified species (Fig. 2B). Importantly, accumulation of neddylated Pcu3p was also apparent in strains deleted for csn3, csn4, and csn5 (Fig. 2A), three genes encoding other putative subunits of the S. pombe CSN, which co-fractionate with Csn1p upon size exclusion chromatography (see below, Fig. 4). However, unlike csn1 disruptants, which have a defect in S phase control resulting in slow growth and cell elongation , deletion of csn3, csn4, and csn5 genes did not cause cell elongation, S phase delay, or any other obvious growth defects (Fig. 2C, 2D, data not shown). This indicates that the described phenotype of csn1 mutants  is unlikely to be a consequence of interference with Pcu3p activity. Pcu1p, another fission yeast cullin also accumulated in the neddylated form in all csn mutants  (Fig. 2A), suggesting that CSN has a general role in the control of cullin neddylation in fission yeast. The accumulation of neddylated Pcu3p was prevented in all csn mutants by providing the missing CSN subunit on a plasmid (Fig. 3). Neddylated Pcu3p accumulates in csn mutants. (a) The indicated csn genes were disrupted in a pcu3-13myc background. Cell lysates of these strains were probed with antibodies against Myc and Pcu1p to reveal neddylated and unmodified forms. 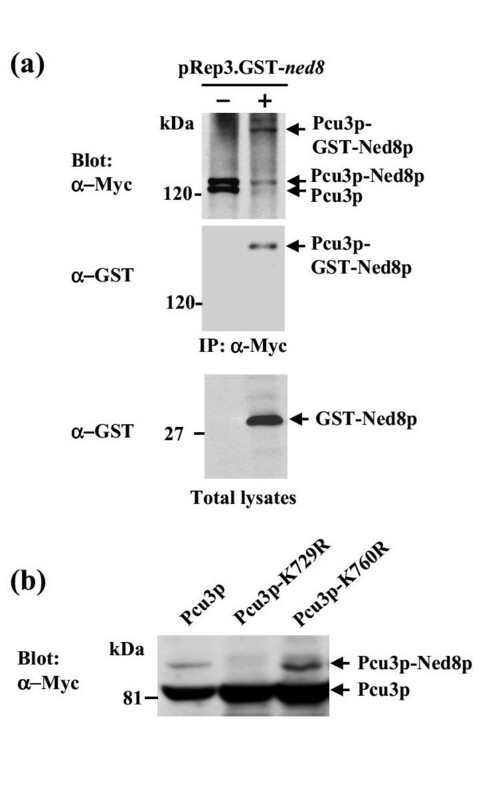 (b) GST-Ned8p was overexpressed in csn1 mutants, and modified Pcu3p was detected by immunoblotting with Myc antibodies. The star denotes an unidentified cross-reactive band. (c) Morphology of csn mutants. The indicated strains were fixed in formaldehyde, mounted on microscope slides, and photographed. The elongation phenotype of csn1 mutants is not apparent in other csn mutants. (d) DNA content of csn mutants. The indicated strains were grown to mid log phase, fixed in ethanol, and analyzed by flow cytometry. Note that the broadening of the 2C peak indicative of the described slow S phase progression of csn1 mutants  is completely absent from other csn mutants. Complementation of csn mutants. The indicated csn mutants in a pcu3-13myc background were transformed with pRep81 plasmids driving the expression of the respective 6 × histidine-Myc-tagged csn genes. Cells were maintained in the presence (promoter off) or absence of thiamin (promoter on) to regulate expression. Expression of endogenous Pcu3p-13Myc (a) and exogenous CSN subunits (b) was determined by immunoblotting with Myc antibodies. The weak complementing activity of some of the plasmids even in the repressed state may result from leakiness of the nmt1 promoter . Pcu3p interacts with CSN. (a) Lysates prepared from cells containing Myc epitope-modified Pcu3p, Csn3p, Csn4p, and Csn5p, or HA-tagged Csn1p were fractionated by gel filtration. Fractions were probed with Myc and HA antibodies to determine the elution profiles of the respective proteins. Size standards are indicated. Pcu3p-Myc was not resolved into the neddylated and deneddylated forms on this gel. (b) Lysate from csn1-3HA and pcu3-13myc csn1-3HA cells, which carry epitope-tagged versions of Pcu3p and Csn1p at the endogenous genomic locus, were immunoprecipitated with Myc antibodies followed by immunoblot analysis with Myc and HA antibodies. Co-precipitated Pcu3p-13Myc and Csn1p-3HA are indicated. Specificity controls for the immunoprecipitation include an irrelevant antibody (left panel) and a strain lacking Pcu3p-Myc (right panel). (c) The same strains as used in Fig. 3A were induced to express the indicated 6 × histidine-Myc-tagged CSN subunits. CSN subunits were absorbed on Ni-NTA agarose beads, and co-purification of Pcu3p-13Myc was determined by immunoblotting with Myc antibodies. In the control lane, lysate from nontransformed pcu3-13myc cells was used. Note that Csn3p, while inefficiently expressed in the total cell lysate, is equally retained on Ni-NTA beads, probably due to better accessibility of the 6 × histidine tag. Lyapina et al. recently demonstrated that partially purified CSN promotes the cleavage of Pcu1p-Ned8p conjugates in vitro , but it remained unclear whether the enzymatic activity is contained within one of the CSN subunits or a tightly associated peptidase. All peptidases known to cleave ubiquitin- or SUMO-protein conjugates are cysteine-based proteases (reviewed in ref. ). Csn5p contains a motif closely resembling the conserved cysteine box previously recognized in the catalytic center of deubiquitylating enzymes and in the budding yeast proteasome subunit Rpn11p . The complementation assay shown in Fig. 3 allowed us to determine the potential role of this motif in the control of Pcu3p neddylation by replacing the critical cysteine residue with alanine. 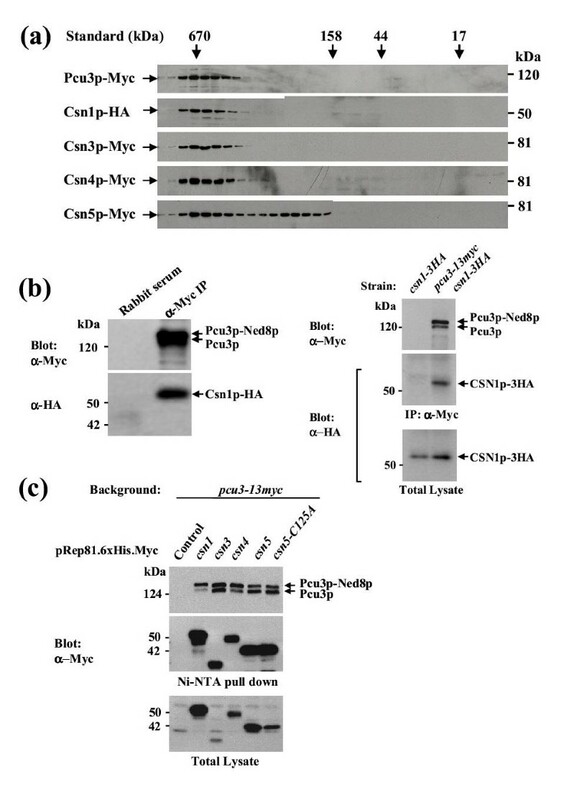 This mutant Csn5p retained full activity for preventing Pcu1p and Pcu3p hyperneddylation (Fig. 3A lanes 12-15, and data not shown). We next determined whether the effect of CSN deficiency on Pcu3p neddylation reflects a physical interaction of these proteins. Size exclusion chromatography of lysates prepared from cells harboring epitope-tagged Pcu3p or CSN subunits at the endogenous genomic loci, revealed precise co-elution of Pcu3p with CSN subunits 1, 3, 4, and 5 in high molecular weight fractions corresponding to approximately 550 kDa (Fig. 4A). Interestingly, Csn5p, unlike the other CSN subunits, showed a second peak in gel filtration eluting with an approximate molecular weight of 200 kDa, suggesting that Csn5p may also be involved in protein complexes separate from the entire CSN (Fig. 4B). Based on the co-elution of Pcu3p with CSN subunits in gel filtration, we determined whether Pcu3p and Csn1p interact in vivo at endogenous expression levels. Pcu3-Myc immunoprecipitated from lysates of cells expressing HA-tagged Csn1p together with Pcu3p-Myc from the endogenous promoters revealed co-precipitation of Csn1p-HA. This interaction was specific as it was not observed with an irrelevant antibody (Fig. 4C left panel) or with lysate from a strain containing untagged Pcu3p (Fig. 4C, right panel). In contrast, immunoprecipitation with HA antibodies failed to precipitate both Csn1p-3HA and Pcu3p-Myc, potentially due to inaccessibility of the C-terminal 3HA tag of Csn1p within the CSN complex (data not shown). We therefore generated Pcu3p-Myc containing strains overexpressing N-terminally 6xhistidine-Myc-tagged Csn1p, Csn3p, Csn4p, or Csn5p. Binding of each of the four different CSN subunits to nickel beads resulted in co-purification of Pcu3p, indicative of specific in vivo interactions (Fig. 4C). Notably, both modified and unmodified Pcu3p interacted with CSN subunits (Fig. 4C). We conclude that, at least a fraction of Pcu3p forms a stable complex with CSN in vivo. In A. thaliana, CSN was shown to be required for the efficient nuclear accumulation of the putative RING-type ubiquitin ligase COP1 , which mediates ubiquitin-dependent degradation of the photomorphogenic transcription factor HY5 . We therefore considered the possibility that accumulation of neddylated Pcu3p in csn mutants is a consequence of defective subcellular targeting. Indirect immunofluorescence staining indicated that endogenous Myc-tagged Pcu3p is present in the cytoplasm, but enriched in the nucleus of wild-type cells (Fig. 5). This localization pattern was fully preserved in all four csn mutants, indicating that CSN does not regulate the subcellular localization of Pcu3p. Localization of Pcu3p in csn mutants. The indicated strains were fixed and processed for indirect immunofluorescence staining of Pcu3p-Myc with Myc antibodies as described in material and methods. All human cullins have been shown to assemble into complexes possessing polyubiquitylation activity in vitro [9, 26]. To determine whether Pcu3p is associated with such an activity and how it is affected by CSN, we developed a substrate-independent in vitro polyubiquitylation assay, similar to that originally reported by Lyapina et al. . As Pcu3p-associated ubiquitin ligase activity was not described before, we first needed to determine which of the fourteen different ubiquitin-conjugating enzymes (UBCs) present in the fission yeast genome associate with the RING domain protein Pip1p, an essential cofactor of cullin ubiquitin ligases [7, 28,29,30]. Binding assays showed that overexpressed HA-tagged Pip1p specifically associated with co-overexpressed 6xHis-Myc-tagged Ubc1p, Ubc7p, Ubc11p, Ubc12p, Ubc13p, Ubc14p, and Mms2p. In the next step, we confirmed, by immunoprecipitation, that both forms of Pcu3p-Myc bound endogenous Pip1p in a CSN-independent manner (Fig. 6B). Pcu3p in vitro ubiquitylation activity. (a) Each of the 14 S. pombe UBCs were co-overexpressed as 6 × His-Myc-tagged versions with HA-tagged Pip1p from plasmids. UBCs were bound to Ni-agarose beads and co-purifiyied Pip1p was detected by HA antibodies. (b) Lysates prepared from pcu3-13myc and pcu3-13myc Δcsn1 cells were immunoprecipitated with affinity-purified antisera against Pip1p and precipitates were analyzed for coprecipitation of Pcu3p by immunoblotting with Myc antibodies. (c) Pcu3p-associated ubiquitin ligase activity. Pcu3p complexes were immunoprecipitated from the indicated strains with Myc antibodies and polyubiquitylation assays were performed as described in materials and methods using the UBCs indicated ("3" denotes human UBC3/CDC34). Total lysates used for immunoprecipitation and the resulting Pcu3p immunocomplexes are shown in the lower panels. 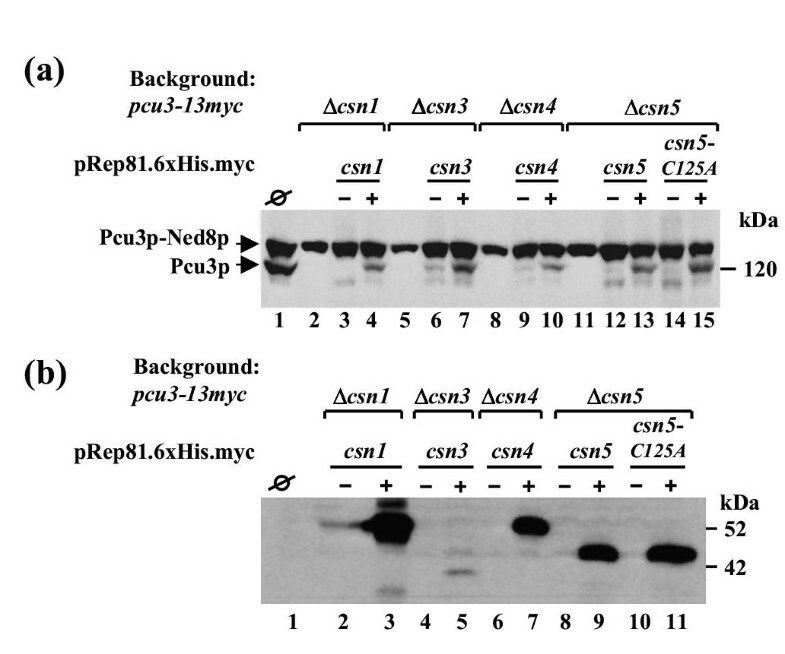 Pcu3p-Myc is not clearly revolved into the neddylated and unneddylated forms in these gels. (d) Ubiquitination assay with Pcu3p-Myc complexes isolated from the indicated strains were performed with wild-type ubiquitin or a mutant lacking all lysines (Ub-R). 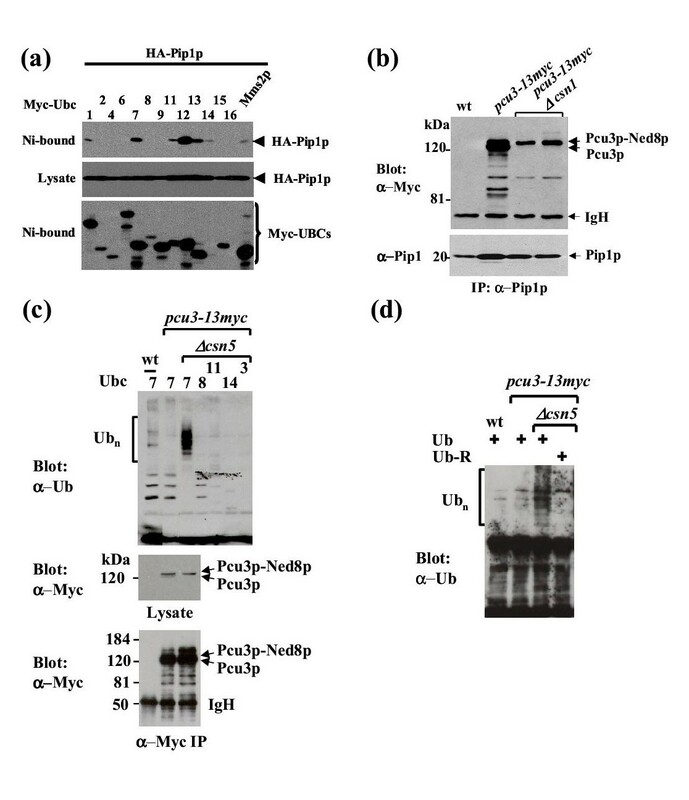 Pcu3p-Myc complexes prepared by immunoprecipitation with Myc antibodies were then incubated with human E1, ATP, ubiquitin, and the recombinant UBCs that interacted with Pip1p. Polyubiquitylated species were visualized by anti-ubiquitin blot. Pcu3p-Myc complexes isolated from pcu3-13myc cells did not show any recognizable polyubiquitylation activity above background with any of the seven UBCs tested (Fig. 6C, lane 2, and data not shown). In contrast, the ubiquitylation assay with Pcu3p-Myc complexes purified from csn5 mutants led to efficient formation of high molecular weight species reactive with ubiquitin antibodies (Fig. 6C). This activity was specific for Ubc7p (Fig. 6C, compare lanes 3 - 7). Appearance of multiubiquitin chains was inhibited by mutant ubiquitin lacking all lysines, indicating that they were specifically generated in the reaction rather than co-precipitated with Pcu3p-Myc (Fig. 6D). Thus, CSN deficiency appears to stimulate Pcu3p-associated ubiquitin ligase activity in vitro. A similar stimulation was obtained for substrate-specific polyubiquitylation of phosphorylated Rum1p by SCFPop purified from csn5 mutants (unpublished observation). Our data confirm and extend the recently discovered connection between CSN and cullin regulation  by showing that deletion of four putative CSN subunits causes accumulation of Pcu3p in the neddylated state (Fig. 2A). Co-elution of these four proteins in a 550 kDa complex (Fig. 4B) strongly suggests that they represent part of the S. pombe equivalent of the eight subunit CSN complex found in higher eukaryotes [18,19,20]. Thus, cullin regulation through modulation of the balance of Ned8p modification appears to require the entire CSN complex. Our study also provides some insight into the role of deneddylation in cullin function, as we were able to create a situation in which Pcu1p and Pcu3p are fully neddylated in vivo (ref  and data presented here). Deletion of pcu1 and pcu3 results either in lethality or in severe growth retardation, respectively . The normal growth behavior of csn3, 4, and 5 mutants (Fig. 2C,2D), where both cullins seem constitutively neddylated, argues against a critical role for dynamic cycles of neddylation and deneddylation in cullin function in fission yeast. Consistent with this notion, the subcellular localization of Pcu3p and Pcu1p were unaffected by mutations in CSN (Fig. 5) . 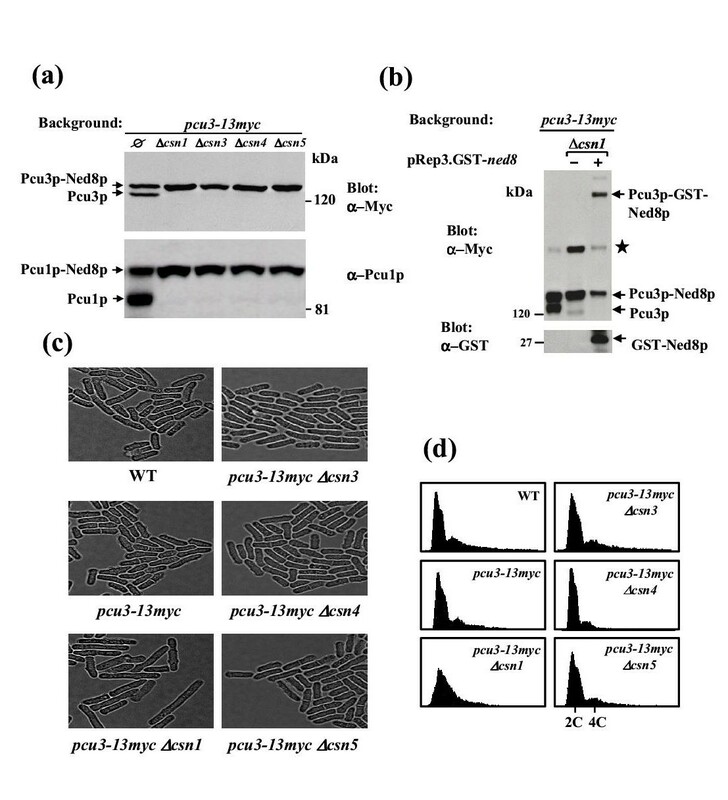 Instead, neddylated Pcu3p and Pcu1p purified from csn mutant cell extract exhibit increased ubiquitin ligase activity in vitro (Fig. 6B) . Thus, CSN may exert negative control on Pcu1p and Pcu3p by promoting their deneddylation. However, while mutation of csn5 caused a modest two-fold increase in the steady state fraction of neddylated Pcu3p (Fig. 2A), Pcu3p-associated ubiquitin ligase activity recovered from this mutant showed a much more dramatic increase (Fig. 6C). This suggests the possibility that CSN represses Pcu3p activity by other mechanisms, in addition to its control of neddylation. Further experiments are required to determine whether recombinant Csn5p or purified CSN complex can inhibit Pcu3p-associated ubiquitin ligase activity. Lyapina et al. recently provided evidence for a cullin deneddylating activity of CSN by demonstrating that a partially purified preparation of the pig CSN can deneddylate the fission yeast cullin Pcu1p in vitro . The results presented here eliminate the attractive hypothesis that the cysteine box in Csn5p, which is conserved in numerous deubiquitylating enzymes , harbors a critical activity for deneddylation (Fig. 3A). In addition, recombinant Csn5p failed to deneddylate Pcu1p and Pcu3p in vitro (unpublished observation). Our finding that hyperneddylated Pcu3p and Pcu1p accumulate in all csn mutants tested (Fig. 2A, and data not shown), also suggests that control of cullin neddylation results from cooperation of multiple CSN components rather than from the activity of a single catalytic subunit. The CSN complex may, for example, serve as a platform for recruitment of a separate deneddylating enzyme. A human NEDD8-processing isopeptidase has been described previously . The potential role of CSN as an organizing center for certain enzymatic activities may not be restricted to the control of cullin neddylation, as CSN was also shown to mediate phosphorylation of c-JUN, IkBa, and p53 by a tightly associated kinase(s) [12, 19]. So far, we were unable to obtain deneddylation of Pcu3p-13Myc in vitro by partially purified CSN preparations active in deneddylation of Pcu1p-13Myc (data not shown). We can therefore not exclude that CSN's role in the control of Pcu3p neddylation differs from its role established for Pcu1p . For example, binding by CSN could protect Pcu3p from the Ned8p-conjugating enzyme Ubc12p, thus maintaining a fraction of Pcu3p in a deneddylated state. As this shield is experimentally removed through deletion of CSN subunits, Pcu3p may accumulate in the neddylated state. In such a scenario, no enzymatic activity of purified CSN toward neddylated Pcu3p would be expected in vitro. Finally, our data suggest CSN functions in addition to cullin regulation that are not shared by all individual subunits. Out of the four mutants tested, only csn1 showed the previously described defect in S phase progression  (Fig. 2C,2D), thereby underscoring the significance of our finding that all CSN subunits tested here are involved in cullin regulation. It is likely that some subunits have very specialized functions within the complex, while others are required for its broader activities such as control of cullin neddylation. On the other hand, we found that a sizable fraction of Csn5p is dissociated from the putative CSN holocomplex, but enriched in a 200 kDa assembly (Fig. 4B). It thus appears that part of the diversification of CSN function may arise from formation of smaller subcomplexes. Our study reveals a general role of the S. pombe CSN complex in the control of cullin modification by Ned8p. Regardless of the exact mechanism, CSN may regulate the activity of multiple cullin ubiquitin ligases through counteracting their stimulatory Ned8p modification. Future studies will reveal whether some of the other described functions of CSN also involve post-translational modification of regulatory proteins by ubiquitin-like modifiers. S. pombe genes for UBCs and csn3, 4, and 5 were identified in the Sanger Centre S. pombe sequence database based on their homology to the respective human and budding yeast proteins. Complementary DNAs were amplified by PCR and subcloned into pRep81.6xHis-Myc, pRep3.6xHis-Myc, or pRep4.HA. Deletion strains and epitope-tagged strains were constructed by one-step gene replacement using PCR-generated fragments containing kanamycin or ura4 cassettes . Growth media, flow cytometry, and all other relevant S. pombe techniques were described previously . Protein lysates were prepared by bead lysis in a Fastprep device (Bio 101) in the presence of proteinase inhibitors, followed by boiling in SDS sample buffer. Pip1p and Pcu1p were detected with affinity-purified rabbit antisera. Epitope-tagged proteins were detected by the monoclonal antibodies 9E10 and 12CA5 prepared from hybridoma supernatants. Cell lysates for immunoprecipitation were prepared by disrupting cells in immunoprecipitation buffer (20 mM Tris/HCl, pH 7.4; 150 mM NaCl; 0.5 % Triton X-100, 10 μg/ml leupeptin, 10 μg/ml pepstatin, 5 μg/ml aprotinin, 1 mM PMSF). Lysates were cleared and precipitated with the respective antisera. Immunocomplexes were collected by binding to protein A or G beads, washed and analyzed by immunoblotting as described . For indirect immunofluorescence staining, cells were fixed in freshly prepared 3.7% para-formaldehyde for 1h at 30°C. Cells were washed in PEM (100 mM Pipes pH6.9, 1 mM EGTA, 1 mM MgSO4), and digested with Novozyme (0.5 mg/ml, Sigma) and Zymolyase (0.5 mg/ml, US Biological) in PEM, 1M sorbitol. Unspecific epitopes were blocked by incubation in PEM-BAL (PEM plus 1% BSA, 0.1% Na-azide, 0.1 M L-lysine HCl) for 1h. Incubation with monoclonal Myc antibodies diluted in PEM-BAL was done overnight, followed by three washes in PEM-BAL. An overnight incubation with TRITC-labeled anti mouse antibodies was followed by washing and mounting on polylysine coated coverslips. Cell nuclei were counterstained with DAPI. Photomicrographs were obtained with a CCD camera mounted on a Nikon E600 epifluorescence microscope. Brightness and contrast were adjusted in Adobe Photoshop 5.0. For ubiquitylation reactions, Pcu3p-Myc complexes were immunoprecipitated from 100 - 200 ug total cell lysates prepared as described above. Precipiates were washed four times in 20 mM Tris/HCl, pH 7.4; 150 mM NaCl; 0.5 % Triton X-100, 10 μg/ml leupeptin, 10 μg/ml pepstatin, 5 μg/ml aprotinin, 1 mM PMS, and equilibrated in 20 mM HEPES, pH 7.4, 100 mM potassium acetate, 1 mM DTT. The reaction was started by the addition of a cocktail of 8 μM ubiquitin, ATP regenerating system (2 mM HEPES at pH 7.4, 1 mM ATP, 30 mM creatine phosphate, 1 mM magnesium acetate, 0.15 mg/ml creatine kinase), reaction buffer (4 mM magnesium acetate, 1 mM DTT), 500 nM bacterially expressed 6xHis-UBCs, 100 nM 6xHis-tagged human E1, and 0.5 μM ubiquitin aldehyde in a volume of 15 μl. After 90 min at 30°C, the reaction was terminated by the addition 5 × SDS sample buffer. Samples were separated on 11 % SDS-polyacrylamide gels and analyzed by immunoblotting with ubiquitin antibodies (Zymed). We thank F. McKeon for hybridoma lines, R. King for the human E1 plasmid, D. Griffiths for numerous technical suggestions, and C. Maki and Z. Yuan for critical reading of this manuscript. This work is supported by NIH grant GM59780 to DAW.